Every household should have the right measuring items, whether if it's the cups for solid, for liquid as well as for spoonful measurements. This would make the baking and cooking procedure very precise and quick. I never had so many chances using measuring things during my youthful days, who does? All we care is ourself, be with friends, eat the prepared food our mother's cooking. And none of this baking and cooking does exist, that's my perspective while I was in the mind of a teenager. Recently, things have changed, I'm married to a very loving and supportive husband, a mother of two lovely boys and baking and cooking is now part of my daily routine. I got to make some healthy foods for my family now and since my Mama isn't around to cook for us [I always love her cooking, that's why I want her to cook for me] I would have to do it. 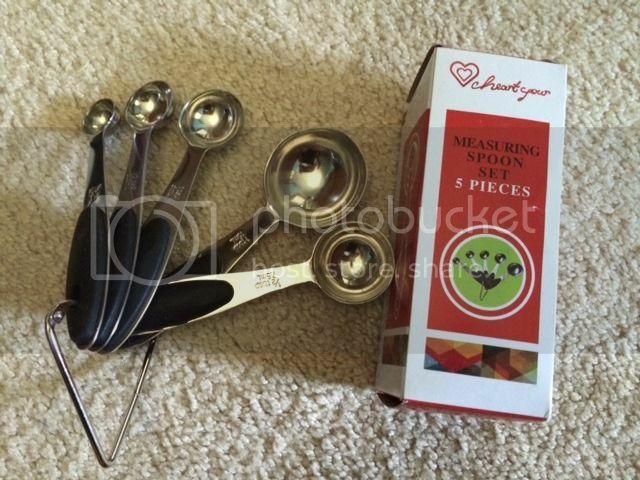 I'm going to review a nice Stainless Steel Measuring Spoon 5pc Set from Heart Your company today. I do need a new pair, cause I want to make sure that I have every single measuring tablespoon whenever I needed them. We have some before and for some reason, I must've misplaced and no longer to find at least 1 of the measuring spoon. Save your lectures, I already got so much from my husband. Anyways, the product arrives in the mail through the USPS. I don't see any signs of damage and so I was able to use the measuring spoons right away. It's wrapped in a plastic bag, the measuring spoons are intact. I like the metal that holds all together, makes it safe not to lose one. I like the rubber handle makes it easier to hold and grab the spoon. I adore the stainless steel, the 5 pieces comes with a complete measuring spoon set: 1/4 tsp, 1/2 tsp, 1 tsp, 1/2 tbsp, and 1 tbsp. It's safe to wash in a dishwasher. Simple just what I need. This looks like a nice set. I love to bake and I have a few sets of measuring spoons at home. I would like a set like that, mine are all plastic. These looks great!